When we last saw me, I was wandering a field in south-east England. A few hours later, after taking a circular route that saw me walking through more fields, a small forest and getting cut up by even more thistles and thorns, I wound up back at the train station as clouds started to roll in. The train arrived just in time. After 15 minutes later the rain started to come down. Riding back, my plan had been to take the train to Blackfriars Station and then the tube home, but looking at my train schedule a name popped out at me and I decided to take a detour. Elephant and Castle. 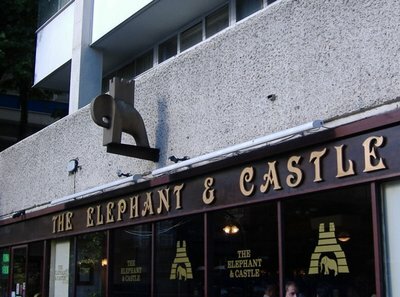 The name Elephant and Castle was familiar to me, as it is the name of a chain of British pubs in North America with locations in Toronto, the rest of Canada and the US. 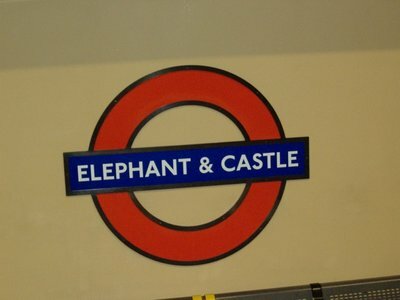 It wasn’t until I arrived recently in London and looked closely at my tube map that I realized that the name Elephant and Castle wasn’t just two randomly squeezed together words (as pub names often are), but the name of an area in London. It’s the name of a tube station as well as a national rail station. 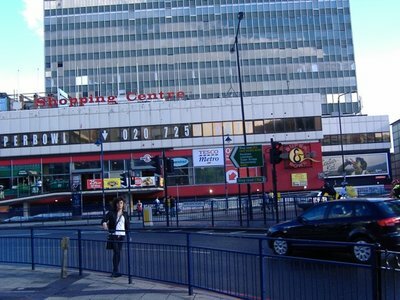 The road between two round-abouts in the area is called Elephant and Castle, as is the shopping centre adjacent to road. In fact, the whole area has started to take on the name Elephant and Castle, replacing the previous name Newington in even official documents, like this website outlining a regeneration project in the area. I pulled out my tube mapped and confirmed that I could still get home without issue, taking the Bakerloo line, which has its terminus at Elephant and Castle up to Baker station and then transferring to the Jubilee line. The rain was really coming down when the train pulled into the station, but luckily the covered platforms let right down in to the Elephant and Castle shopping mall. I puttered around the mall for a few minutes, waiting for the rain to let up. The mall, I later find out, was voted the ugliest building in all of London by Time Out readers in 2005. Soon it was a mere drizzle outside, so I left the confines of the indoor mall and stepped outside and into a very lively multicultural market place. There were tons of stalls crammed into the small space of the moat that surrounds the mall. Heading up from the moat I come across a pub called the Charlie Chaplin. A sign outside provides a brief explanation of why the pub is named after the famous comedic actor. He was born in the area and lived there until moving to the USA to become a famous movie star. The rain starts falling again, so I decide to grab a pint at Charlie Chaplin and wait for the rain to stop. 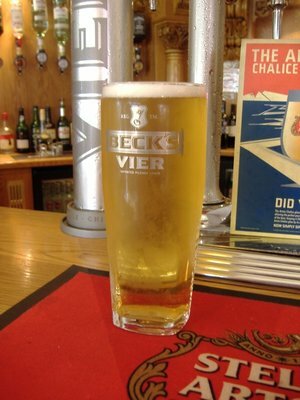 The bartender serves me my pint, and I pop the question. 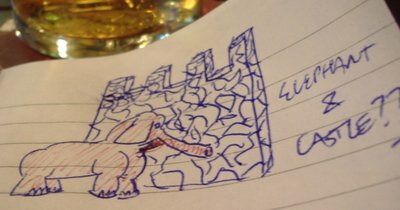 I plop some coins in the juke box and after selecting my songs, spend time doodling in my notepad, drawing an elephant and a castle, very poorly. The elephant comes out looking like a dog with a long nose, and the castle is just a box with some teeth at the top. I have to colour in the elephant with a red pen so it stands out from the castle wall, giving it a faintly pinkish tint. The rain clears up and I move on. Under a subway tunnel and across the street I find a pub called the “Elephant and Castle.” Surely they’ll know the truth. A sign out front says that the pub sits on the site of a theatre dating back to the 1600s. I walk in and find a modern looking restaurant, complete with a Thai menu. I take a seat at the bar, not at all the cosy, old English pub I was expecting, but clean and the staff seemed friendly, so I popped the question again. Seems a sensible answer, so I jotted it down in my book and closed the case. At least until I got back to my apartment and could do some research on the internet. Despite Tom’s definitiveness with an answer, it appears that in fact Robbie had it right. No one quite knows why the area is called Elephant and Castle. 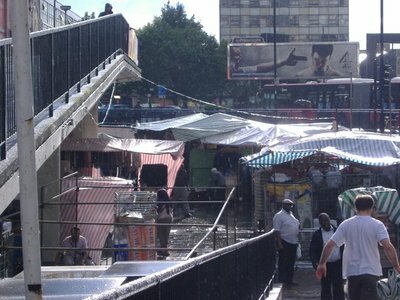 There are lots of theories, most of which are examined in this thread from a local London internet group. The area is named after a pub called the Elephant and Castle. The pub was converted from a blacksmiths in 1790. The blacksmith was affiliated with the Culter’s Company, a maker of swords, knives and other cutlery, who often used ivory in their handles. Their crest has three elephants on it, including one with a howdah on the back, which is a seat used by hunters when riding an elephant. The howdah is shaped like a castle. The name is a bastardization of the words Infanta de Castile, and references a Spanish queen or princess who visited the area. Most often Queen Eleanor of Castile who was the wife of King Edward the first is the one mentioned in this story, though other names can be found. An infanta was the eldest daughter of a king, something that Eleanor was not. Variations on this theme have Infanta meaning young, as the princess in the story was only a teenage when she was married. The name is a reference to the King's menagerie (zoo) located at the Tower of London, thus you have Elephants in castles. A variation on this theme was the theory that Tom from the Elephant and Castle pub was espousing with his Prince Louis and his elephant. What is right we will probably never know, so the case will remain open but cold, I guess. Much like the beer at the Elephant and Castle pub in Elephant and Castle, South London, England.